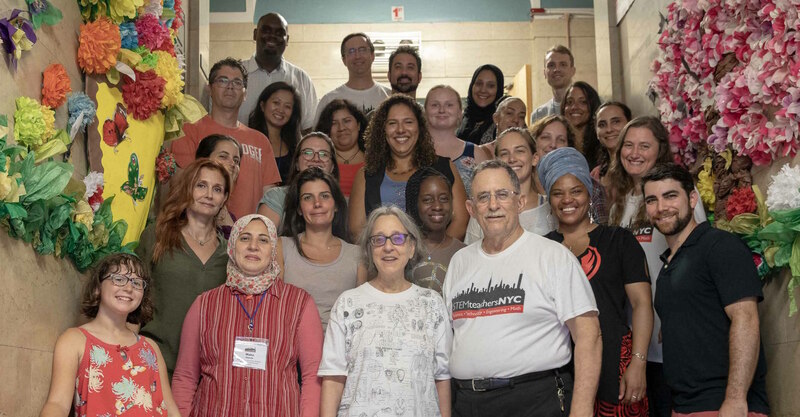 STEMteachersNYC is building on a model developed by the Montgomery Township (NJ) school district to create a cadre of K-3 elementary school teachers in the New York Metropolitan Area who are competent and confident teaching science. The model is based on the work of Hammer and Goldberg, which posits that, if elementary teachers bring the techniques they use to teach reading and writing to grade-appropriate science discussions, more science teaching and learning will happen in elementary classrooms. We call this Kid Talk and Teacher Talk (KT3) in Elementary Science. For three years, Montgomery Township’s science coordinator has led a training program for the district’s elementary school teachers. The model’s goal is to increase teacher self-efficacy, which research shows is correlated to implementation of reform-based teaching. The model has several important parts. It helps teachers recognize their existing expertise and good practice in other subjects and have confidence that these can be applied to science. It links teachers to science pedagogy and content expertise, which teacher surveys show is lacking among elementary teachers, and it provides for ongoing support for implementation. KT3 itself is not curriculum-specific. Instead, it is a pedagogical technique combining STEM disciplines with reading and writing using the NGSS 3-dimensional learning model, where cross-cutting concepts link to other state and local standards. There are three key elements. The first is creating a classroom environment in which students can collect and discuss evidence from the real world. Although initially teachers are often uncomfortable with this fundamental scientific activity, once it is linked to the techniques they use regularly to teach reading, teachers become more self-confident. The second is actually doing experiments and making observations. Here, science kits with their formulaic outcomes are transformed into physical resources facilitating experimentation and generating questions. Thirdly, central to KT3 , is the teacher’s ability to identify good “launching” questions, facilitate sense-making discussion and activities by students, and foster their development of productive conceptual models. Mansfield & Woods-McConney (2012) and many other researchers have recognized primary grade active STEM learning as an area where teachers feel less capable. A significant body of research has focused on the generally low science teaching self-efficacy (STSE) among primary teachers. Furthermore, research shows low self-efficacy is critically tied to low student outcome expectancy. The issue of self-efficacy has been considered in two ways. First, personal self-efficacy has been linked to science content knowledge, and a major focus of primary science professional development has focused on deepening content knowledge. As a result, interventions have shown positive gains on teacher content knowledge but have failed to produce gains in student learning due to a lack of pedagogical content knowledge and a resulting inability to implement authentic inquiry science instruction (Mintzes, Marcum, Messerschmidt-Yates, & Mark, 2013). On the other hand, a bifurcated approach to enhancing STSE has failed to recognize the significant instructional responsibilities of primary grade teachers and, most importantly, failed to link to existing pedagogical expertise, so that active STEM becomes an extension of the active learning already prominent in reading, writing, and mathematics at the primary level. In summary, professional development has focused primarily on raising scientific skill with limited attention to science pedagogy that will help teachers believe they possess the necessary skills and judgements to produce positive student learning outcomes (Albion & Spence, 2013). Amy is the former K-4 Math/Science Supervisor for Montgomery Township Schools. Amy is currently an instructional coach in North Hanover, New Jersey. Lindsay is a 1st grade teacher at MTSD. Lindsay has implemented NGSS strategies with young learners, helping them to develop language and reasoning skills. Last year, Lindsay had the opportunity to work with several English Language Learners. Jason is the 9-12 Science Supervisor at Montgomery HS. He was trained in Modeling Instructional methods by Jess Dykes and Doug Vallett in 2007. He has worked with MHS teachers and Amy Wish to design a district wide-implementation of NGSS. Craig is a physics teacher at Montgomery HS. He is currently a member-at-large for STEMteachersNYC and has been using modeling instruction method for several years, and is an Adjunct Instructor, Department of Physics at the College of New Jeresey.